Well, I was still feeling uninspired. 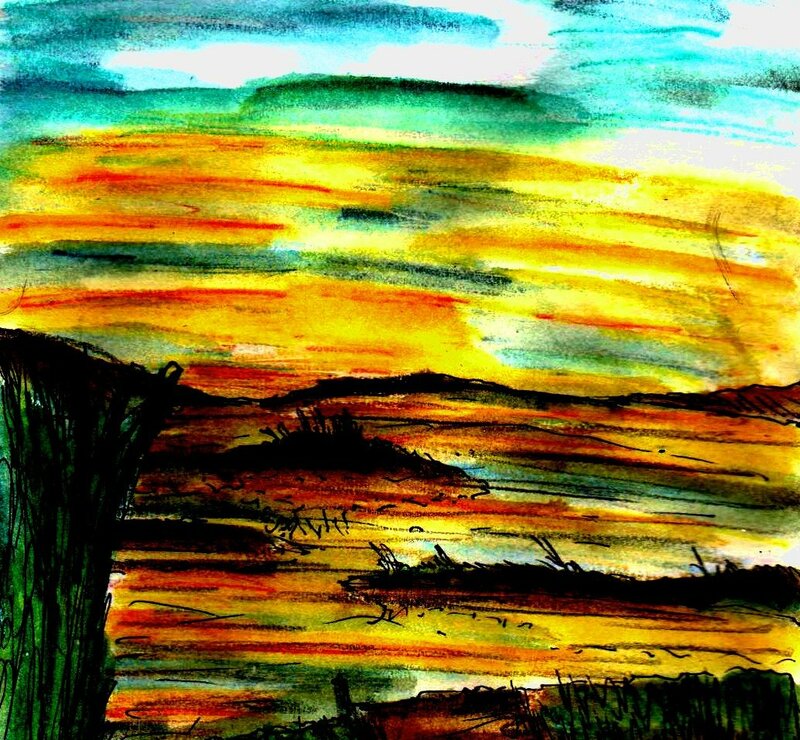 So, I tried to paint a random landscape with a slightly more “realistic” sunset in the background, but unfortunately (despite some extra cropping and digital editing) it didn’t really turn out very well. 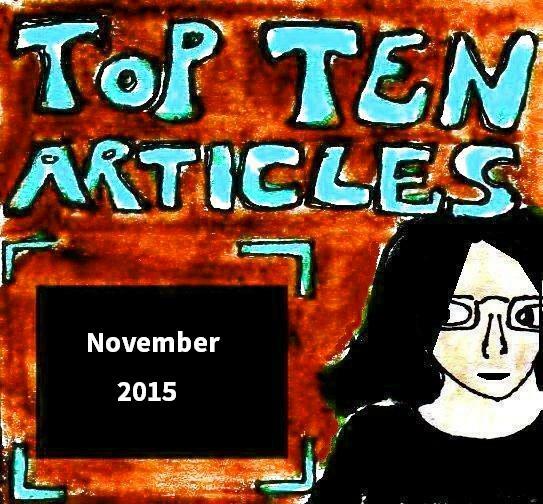 Well, it’s the end of the month and that means that it’s time for me to compile a list of links to my favourite ten articles about writing, comics and/or art that have been posted here over the past month. As usual, I’ll probably include a couple of honourable mentions too. All in all, this was a fairly good month in terms of articles – even if I did end up rambling slightly more than usual. 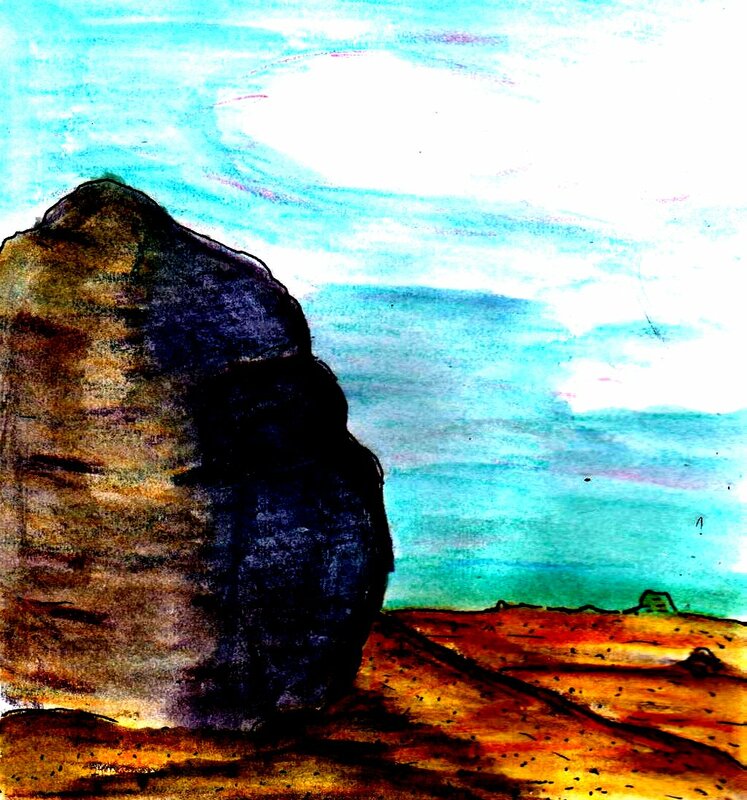 Well, I was feeling uninspired again – so, as I sometimes do in these situations, I made a painting of a desert. 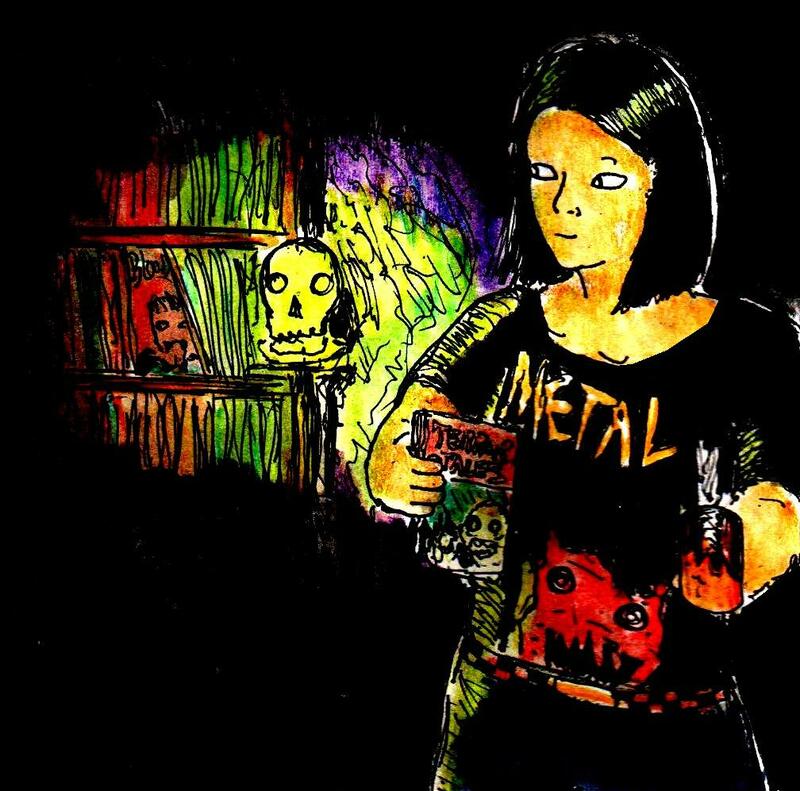 Although I made another short series of gothic paintings beforehand, this punk art series was one of the first times in a while that I’ve made art that was inspired by music. 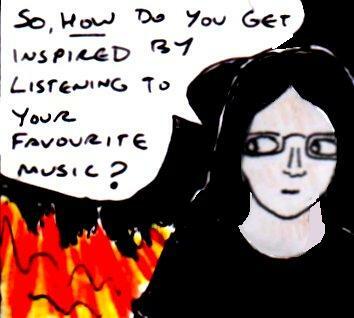 1) Listen: This is probably the most obvious piece of advice on this list but, before you make any musically-inspired art, you should listen to a fair amount of music in the genre that you want to be inspired by and/or by the musicians you want to be inspired by. If it currently seems like the coolest music in the world to you, then that’s a good sign that you’ll be enthusiastic enough about it to want to make art inspired by it. If it doesn’t seem that interesting, then look for another musician or genre of music to be inspired by. 2) Soundtracks and imagination: One of the easiest ways to be inspired by music is to just start daydreaming when you listen to the music you want to be inspired by. Basically, just try to imagine something that either sums up the entire song in a single image or try to think of an interesting scene that would go really well with the music (eg: the music should be the “soundtrack” to this scene, like in a TV show or a movie). Once you’ve thought of this, then just make a drawing or painting of it. It’s as simple as that. 3) Subcultures: One of the best ways to create things that evoke the type of music you’re listening to is to look at everything else that has already been inspired by this type of music. Look at album covers, look at fashions associated with this type of music and look at music videos. I’m sure you get the idea. Whilst you shouldn’t directly copy any of these things, seeing lots of other things that have been inspired by similar music to the type that you want to be inspired by can point you in the right direction when it comes to coming up with your own artistic ideas. 4) Memories: If you’re anything like me, you’ve got something of a musical memory. In other words, certain songs can end up being strongly associated with particular times in my life. This is usually because I’ve been listening to a certain song a lot during one part of my life, but sometimes it can happen if a song just “reminds” me of part of my life (even if I didn’t listen to it back then). So, if you have a memory like this, then one of the easiest ways to make musically-inspired art is just to paint or draw whichever memories a particular song evokes in you. 5) Originality And Meaning: The most important thing when making musically-inspired art is to be original and to be meaningful. In other words, you need to be true to your own imagination. You need to make sure that your artwork is a reflection of your own interpretation of a song, rather than anyone else’s. For example, the song “Gimme Shelter” by The Rolling Stones is often associated with the sixties, the Vietnam war etc… in the popular media. 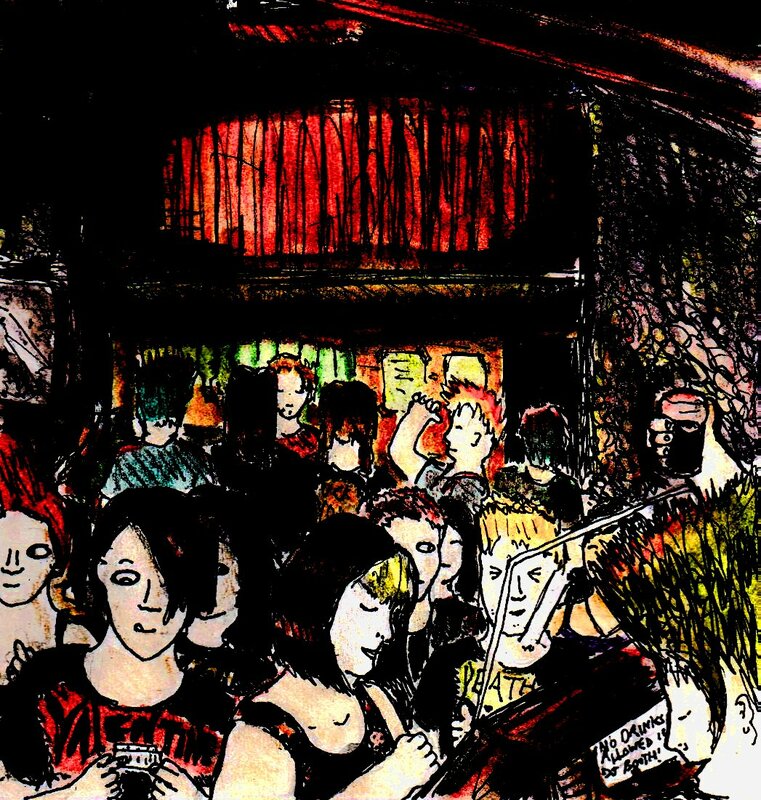 But, to me (thanks to the excellent cover of the song by The Sisters Of Mercy), it’ll always be associated with Aberystwyth in the late 00s and the fiction and art that I made back then. 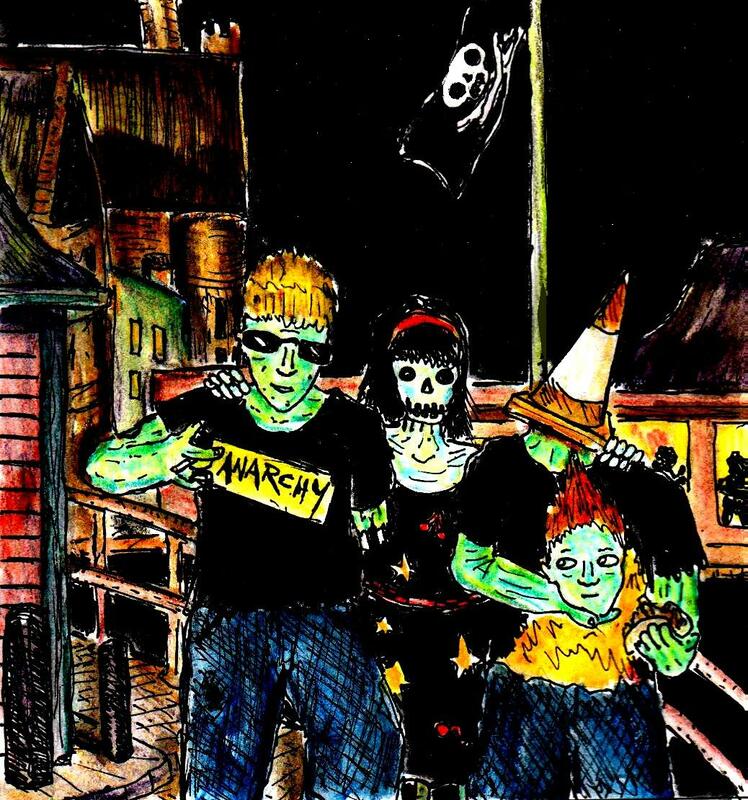 Likewise, when I made my recent punk art series, I’d originally planned to set the paintings in California (since this is where many of my favourite punk bands come from). But, since I’ve never actually been to America, let alone California – I eventually decided that the paintings would be more meaningful if I set them in one of the coolest places I’ve ever been to. Hence why they’re set in Aberystwyth, rather than California. So, stay true to your own imagination and you’ll produce more unique art as a result. Well, I thought that I’d quickly share some of my rambling thoughts about today’s episode of “Doctor Who” called “Heaven Sent”. This is the second part of the series’ three-part finale. “Heaven Sent” begins with an ominous speech about how we are all followed by something in every moment of our lives. We see bloody footprints in the cold stone corridors of a castle. A burnt and bloodied hand twitches and moves in a pile of sand before falling lifeless. Yes, this isn’t your average episode of “Doctor Who”. In case you haven’t guessed already, this is a horror episode. And, my god, what a horror episode it is! Everything from the mysterious zombie-like creature to the gothic set design to the sea bed that is filled with nothing but skulls just oozes gothic creepiness. The best word for this episode would probably be “Lovecraftian“. Everything from the constantly following creature, to the Doctor’s gradually deteriorating emotional state, to the castle’s strange shifting design could have been taken straight from the pages of a H.P.Lovecraft story and, yes, this is as dramatic as it sounds. Although this episode was touted as being the first episode in the show’s history to only include The Doctor, this isn’t strictly true. Since the episode is punctuated by scenes that take place within The Doctor’s mind (which looks a lot like the TARDIS), Clara makes a few appearances here – leaving mysterious advice written on a blackboard or, in one scene, actually talking to The Doctor. But, despite this, you still get the sense that The Doctor is completely and utterly alone as he explores the dark, mysterious castle. Still, Peter Capaldi’s performance in this episode is absolutely stunning. There’s no other way to describe it, this is probably his best episode as The Doctor. Another astonishingly cool thing about this episode are the sheer number of clever plot twists here. Ok, I guessed the episode’s main plot twist about a third of the way through the episode (the clothes by the fire gave it away)- but it’s still revealed in an astonishingly dramatic and creepy way near the end of the episode. Not only that, the way that the main plot twist handled is surprisingly inventive – and some of the Doctor’s more nonsensical actions gradually start to make sense during a dramatic montage near the end of the episode. All in all, this episode is amazing. I know that I’ve thought that other episodes were “the best episode in the series“, but this one towers above them all! It’s an astonishingly good horror episode that is filled with a level of psychological and dramatic complexity that is on a par with, if not better than, many great horror movies. It’s dark, it’s gothic and it’s absolutely compelling. If I had to give it a rating out of five, it would get six and a half! Well, I still wasn’t feeling as inspired as I’d hoped – so, after a while, I ended up making this random heavy metal/horror themed painting. And, yes, I’m terrible at drawing people holding cups of coffee LOL! A few weeks ago, I was watching random “Lazy Game Reviews” videos on Youtube, when I happened to stumble across these two videos (here and here) of the guy who runs the channel exploring an almost-abandoned shopping centre and an abandoned laundry building. It goes without saying, but both of the videos make a point of saying that he followed all relevant safety precautions and had permission to explore both places. Don’t actually try to do anything like this without having both of these things. I’ve never explored an abandoned building (except possibly if it’s been turned into a museum) and I wouldn’t recommend that you do. Anyway, both of these videos are oddly fascinating and they made me think about abandoned places in fiction, art and comics. 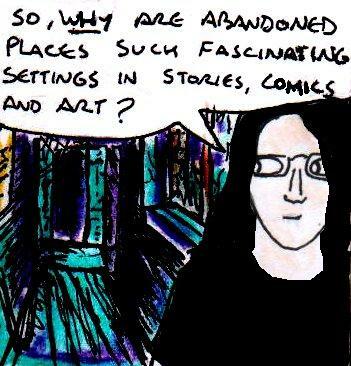 So, I thought that I’d list a few of the reasons why abandoned places can make such interesting settings for stories, comics, paintings, drawings etc…. The first reason is that abandoned places naturally provoke curiosity. If, for example, you see an abandoned building from the outside you’re probably going to wonder what it looks like inside. For example – before it was sadly demolished in 2004, there used to be a really interesting abandoned building in Portsmouth called the Tricorn Centre. It was this giant, retro-futuristic, brutalist building from the sixties that towered above the city. And, every time I saw it, I always wondered what it looked like behind the boards and the locks – but I never got to know. Of course, if you get to see footage of the inside of an abandoned building, then it provokes a totally different type of curiosity. After all, most abandoned places used to be lived in or they used to be places that people visited every day. Since many abandoned places were abandoned fairly suddenly, there are usually still intriguing traces of their previous existence left inside them. There are old signs, there are old personal items and all sorts of other things that make you wonder what that place looked like before it was abandoned. The second reason why abandoned places are so interesting is, obviously, because they’re slightly creepy. They’re dead buildings in the middle of living cities and towns. They’re a sneak preview of the decay and ruination that will eventually happen to everywhere that you know and love in the distant future. They’re mysterious places where anything could be lurking around the corner. They’re also creepy because they’re places where no-one is supposed to explore. But, even if abandoned places don’t contain any ghosts, monsters, vampires, zombies etc… they can still be incredibly creepy, albeit in a very subtle way. Why? Because they make us look at the world slightly differently. After I’d watched the two videos I linked to earlier, I couldn’t help but wonder what the house around me would look like when it is eventually abandoned. Finally, abandoned places are just incredibly fun to describe and draw. There are lots of interesting details that you can add to abandoned places that would look out of place in non-abandoned places. Not only that, you have a much greater degree of creative freedom when you’re drawing or describing abandoned places too – you can show an abandoned place that is literally falling to pieces or you can show somewhere that has been abandoned relatively recently. The only limits are your imagination.